In Idaho, Democrat Walt Minnick, a multimillionaire, former timber executive and environmentalist, mounts a quixotic campaign against Republican Sen. Larry Craig for Senate seat. 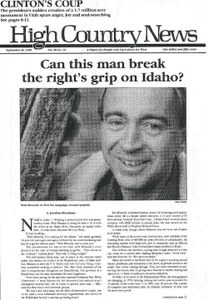 Can this man break the right's grip on Idaho? President Bill Clinton uses the Antiquities Act of 1906 to designate a new 1.7 million-acre national monument in southern Utah, and reactions range from joy to indignation and outrage. Incumbent Idaho Republican Sen. Larry Craig has a strong conservative and industrial backing. Democrat Walt Minnick and incumbent Republican Sen. Larry Craig fall into clear party lines in their views on many issues. Utah Sen. Orrin Hatch, R., in his own words, condemns the new monument. The 1.7 million acres at the new Grand Staircase-Escalante National Monument contain a wide variety of landscapes, life zones and archaeological treasures. Utah's newest national monument will be managed by the BLM instead of the Park Service, and a lot of the details for that management remain to be worked out. Variable voting patterns on the West make it difficult to predict who will win on election day. Western wilderness is too popular for its own good - especially among wealthy foreigners who come to ski at Vail. 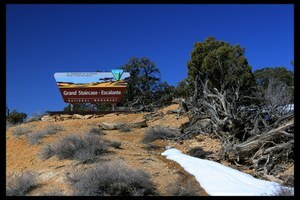 The greatest moments in American conservation history often involved the same presidential audacity - and provoked the same outrage - as President Clinton's establishment of the Grand Staircase-Escalante National Monument. The author says the Escalante belongs as much to the rest of the world as to Utah, and provides a kind of energy that has nothing to do with coal. The 22nd annual conference, "The Producer/Consumer Connection," is being held Oct. 11-13 on Flathead Lake near Rollins, Mont. The New Mexico Wilderness Coalition and Santa Fe chapter of Sierra Club sponsor an Oct. 5 workshop on "Wilderness: The Foundation of Culture." "Unplug America: Give mother earth a rest day" will be held Oct. 13, started by Native American environmental groups, including the Seventh Generation Fund. "Literary Natural History: Scientists and Artists" is a series of free public readings October through April. Jeff Rast of the Center for Small Acreage Farming in Camas County, Idaho, tries to help small farms survive and prosper. "How the West Can Win: A Blueprint for a Clean & Affordable Energy Future" offers environmental alternatives to relying on coal. The report, "Working in Durango, Colorado," documents the economic inequity of a booming Colorado town. Thomas L. Clark's new book, "Western Lore and Language: A Dictionary for Enthusiasts of the American West," documents Western slang. Odds and ends, corrections, fall visitors, web wanderings, llamas continued. Some worry that the land swap proposed to prevent Crown Butte Resources from mining near Yellowstone has only a 50-50 chance of success. Prolific New Zealand mudsnails are invading Yellowstone Park's Madison River, where scientists worry they will disrupt the food chain. A new management proposal for Montana's Glacier National Park, designed to control visitor overcrowding, meets opposition from the local tourism industry and others. Around 900 people were arrested at a protest in Carlotta, Calif., in an attempt to save the Headwaters Grove - the world's largest privately owned redwood forest, from being logged. One of only 132 adult salmon to survive the spawning journey to Idaho's Salmon River is killed - and eaten - by a poacher. Justice Department lawyers go after Canadian mining magnate Robert Friedland for the Summitville gold mine cleanup in Colorado. Wyoming businessman Mark Alldredge files 104 mining claims in Montana's Rocky Mountain Front, possibly searching for diamonds. Local Navajos lead the fight against Hydro Resources Inc.'s plan to leach uranium from groundwater at three sites on or near the Navajo Reservation. If they build it, will more come? A plan to build a visitor's center for Utah's Grand Gulch worries some, who fear more people - including pothunters - will be encouraged to visit the area. The President's Advisory Council on Historic Preservation says the Forest Service erred by letting construction of a telescope on Arizona's Mount Graham begin before the cultural significance of the site had been considered. The Crested Butte Ski Resort in Colorado drops its plans to build new ski runs on a neighboring mountain. Utah's plan to enlarge I-15 in Salt Lake City worries some environmentalists, farmers and hunters, who say the proposed highway corridor includes lakeside wetlands and farmland.